Our WorldTimeServer Gadget allows users of Microsoft Windows 7 or Windows Vista to put current local times for your chosen locations around the world right on your desktop! This desktop clock gadget is FREE, but requires Microsoft Windows 7 or Windows Vista, Adobe Flash Player and a live Internet connection. Note to 64-bit users: Adobe has not released a version of the Flash Player that supports 64-bit operating systems yet. If you wish to use Vista Sidebar Gadgets like this one which require the use of Flash, you will have to exit your current version of the Windows Sidebar and open the 32-bit version in the Programs (x86)/Windows Sidebar folder instead! The current version is 1.3.0.0, released on 26 January 2010. You can download v1.3.0.0 here! Windows will allow you to add multiple copies of this gadget, each with their own customized settings, as you can see in the picture to the right. Windows Gadgets can also be dropped onto your desktop, so you can place them in the background anywhere you like, not just in the sidebar region of your screen. 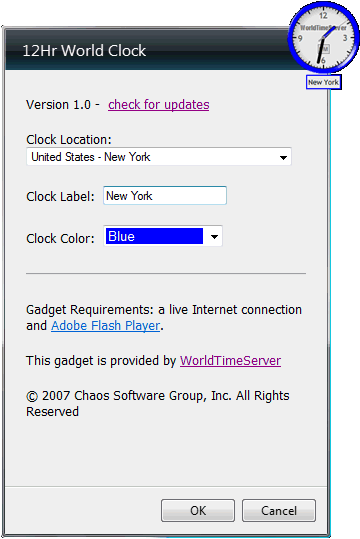 This gadget can be customized by you to show the current time in any location provided by WorldTimeServer.com. You can also specify the label and color for the clock. Version 1.3.0.0 adds some new time zone locations for Mexico to reflect Mexico's new Daylight Saving Time rules for 2010. Version 1.2.0.0 fixes a problem with certain locations not being selectable. The list of time zone locations was also brought up-to-date. Version 1.1.0.0 adds supports for some new time zone locations recently added to WorldTimeServer.com. Version 1.0 was the initial release.